This came in the mail a couple of days ago — a non-descript Dell catalog with more of the latest and greatest in cheap consumer computers. (And displays, but, I order online when the prices are favorable). This looks like a nice little ad for Windows Security software. Attentive users, clean design. But wait, what’s that laptop? What we have here is a first generation tibook, complete with the paint rubbing off where the user’s wrists rest on the white surround. Oh, and the logo is photoshopped out of it. I don’t know if this is Dell’s doing, or if it’s something from Trend Micro, but the message here is: It’s not safe to use our products on the net, and if you do, you need something else. And that something else is an old Mac. I’m guessing here that someone took this as stock photography, and to avoid trademark issues, they surgically removed the big Apple logo on the screen lid. 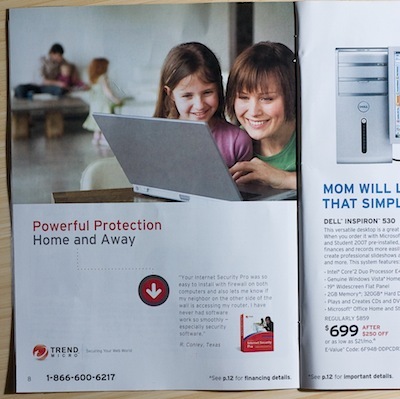 Someone picked it up and used it in the ad, not realizing that it’s a competitor’s laptop. If Dell commissioned it, I just don’t see them saying to just use a mac.